Following the execution of over 80 search warrants in 17 federal districts, the CEOs, COOs and others associated with five telemedicine companies, owners of dozens of durable medical equipment (DME) companies as well as licensed medical professionals were indicted for health care fraud in early April. 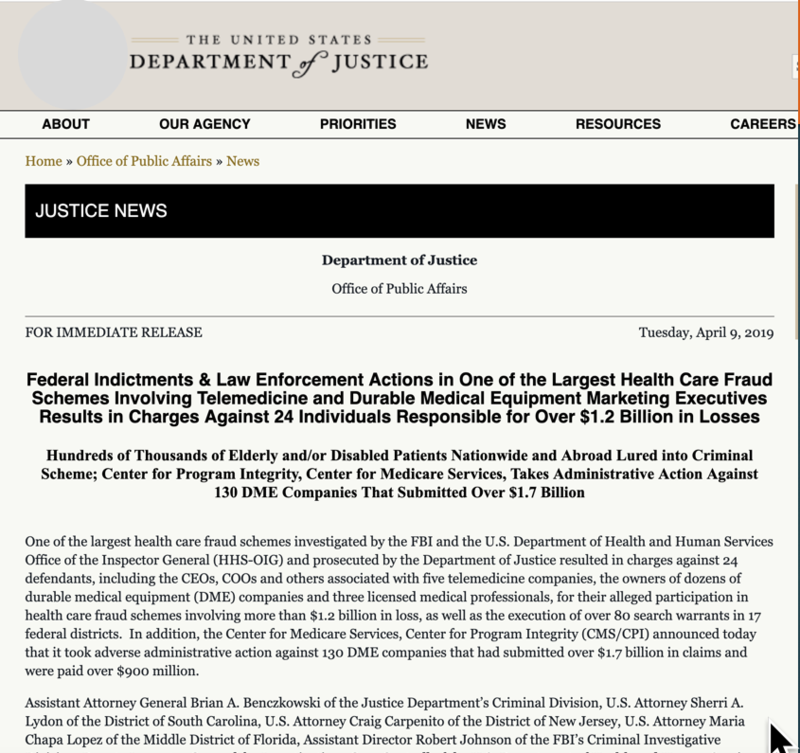 In one of the largest health care fraud crackdowns ever investigated by the FBI and the U.S. Department of Health and Human Services Office of the Inspector General (HHS-OIG) and prosecuted by the Department of Justice, 24 defendants were recently indicted for allegations that included telemedicine Medicare fraud. Losses are estimated at being more $1.2 billion. The alleged telemedicine Medicare fraud cases are being prosecuted and investigated by U.S. Attorney’s Offices nationwide, along with MFSF teams from the Criminal Division’s Fraud Section and from the U.S. Attorney’s Offices in the District of New Jersey, District of South Carolina, Southern District of California, District of Nebraska, Middle District of Florida, Eastern District of Missouri and Western District of Washington; along with agents from the FBI, HHS-OIG, IRS-CI and other federal law enforcement agencies. The Department of Justice announcement made it clear that “A complaint, information or indictment is merely an allegation, and all defendants are presumed innocent until proven guilty beyond a reasonable doubt in a court of law.” Any licensed professionals potentially involved with the scheme through the following five telemedicine companies are encouraged by the FBI to call the FBI hotline: Video Doctor USA, AffordADoc, Web Doctors Plus, Integrated Support Plus and First Care MD. The FBI hotline can be reached by dialing 1-800-CALL-FBI. Additional documents related to this announcement will shortly be available here.